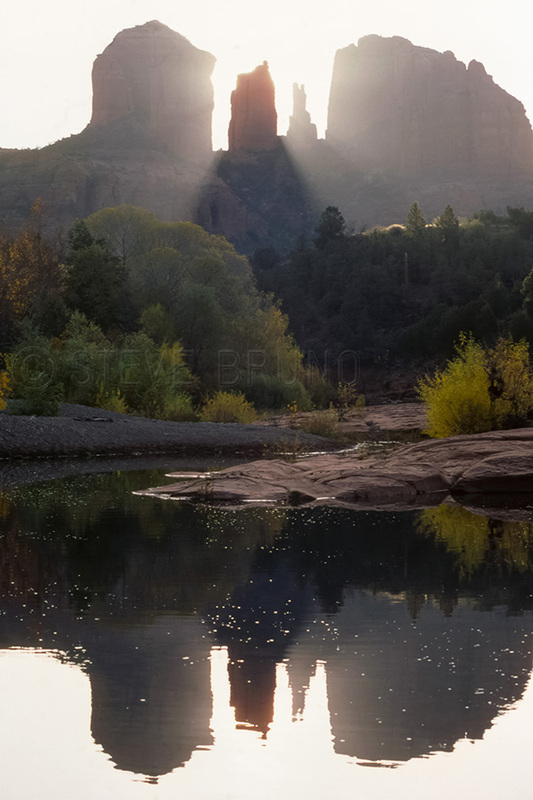 I was in Sedona and Oak Creek Canyon to shoot the autumn colors. The canyon runs mostly north-south and is so deep that there is no golden hour. On the flipside, I can photograph all day long that time of year in the canyon. It was early morning, and it appeared as though it was going to be a bland day. Autumn can get hazy sometimes, and there wasn’t anything motivating me around Sedona, so I headed out towards Red Rock Crossing. This has always been a sunset shot as far as I was concerned. I had never seen a morning shot of it, or been nearby to see that there was potential for a morning shot here. I was really just biding time until I had enough light to get back into the canyon. There is a fair amount of planning that goes into my photo trips, and then sometimes I just get lucky. As the sun came up, there was no scurrying around to get this shot. The day before or the day after might have worked, but I think I timed it precisely. Beautiful shot. I like how you have got the mountain breaking the sun’s rays. Thank You! While the shot might have worked with sun coming up behind one of the larger parts of that rock formation, I think it’s best in the middle.